Update: 25-10-1944, From the Deck log of the Uss Franklin (CV13) Time: 08-12 [Course change annotations omitted] Steaming as before. 0803 completed launching strike baker consisting of 6 VB and 7 VT. 0912 commenced launching CAP. 0914 completed launching CAP consisting of 4 VF. 0930 commenced landing aircraft. 1019 completed landing planes of Strike Able, search group, CAP #1, and 2VT, 2 VB from U.S.S. Enterprise. All planes returned except 13-Tare-11, TBM Bu. No 73456, pilot Ensign T.P. Brooks, Jr., (321264), A-V(N), air crewmen Shane, H.J. 2434951, USN, and Ploger, P.J. 3125009, ARM3c, USNR. Last seen making water landing south of Japanese fleet, position Lat 19-10 N., Long 16-25 E. The three crewmen, Pilot Brooks, and crew Shane (my uncle) and Ploger died at sea. Reportedly, there were pictures taken of the downed plan as further information from the official death notification to the family stated: "When the plane in which he was flying, a unit of Torpedo squadron thirteen, was lost during an attack upon an enemy carrier task force northeast of Luzon Island, in the Philippines. 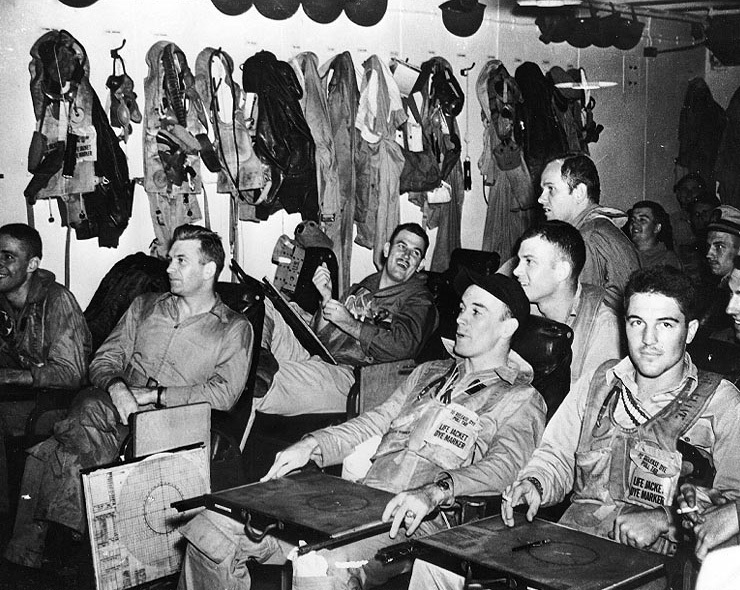 Shane was a member of a plane, one of eight planes, which took off from the USS Franklin to participate in a strike against a Japanese carrier task force. Shane's plane was shot down by an enemy fighter and crashed into the sea after the attack. No survivors were seen to escape from the plan." I would still like to identify the pilots in this picture and searching for any other information specific to this mission on 25-10-1944. Looking at the photo, I was told by my Dad that the young man to the right is last name of Clive. He too was shot down that day and perished. My Dad is pictured next to Clive. His name was John McKinny. My Dad's flight log also lists Pilot Freligh as having been shot down. His log states he dropped 2000 pound bombs on this mission and assisted in the sinking of an enemy carrier. Fascinating stuff. Some minor details emerge: “Christopher-Duluth” excerpts the Franklin Deck Log listing the BuNo of Ens Brooks’ aircraft. This BuNo was part of a batch of TBM-1C Avengers that, up to now, has not appeared on the list of Navy & Marine BuNo’s so it is always good to learn the fate of these aircraft. The coordinates of the ditching are problematic, however. 19-10 N, 16-25 E is in the middle of the southern Sahara. The engagement where Ens Brooks was lost was the Battle off Cape Engano so 19-10 N, 126-25 E is more likely. Certainly these are mere clerical details, however, and they in no way overshadow the courage of any of these brave young men. The fellow to the furthest right, with the cigarette, is my father, William Dean Ray. He put a torpedo into the Zuiho a bi later. I enjoyed your book, Inferno Mr. Springer. I'm sorry you weren't able to get in touch with my dad, but it brought back many memories of the stories he told me over the years. He passed away in October. Of 2012 and I read your book shortly thereafter. Thank you for memorializing the brave men!